BELLEVUE, Wash., Oct. 16, 2018 /PRNewswire/ -- Expedia.com® released the results of its 18th annual Vacation Deprivation® study today, which examines vacation usage and trends across 19 countries. The report found that global vacation deprivation is on the rise, and that workers in the U.S. took the fewest number of vacation days in the world in 2018, alongside Japan and Thailand. With the number of U.S. vacation days awarded and taken at a five-year low, it's no wonder that vacation deprivation levels for Americans are at a five-year high (59%, up 8% from 2017). According to the report, American workers received 14 vacations days and used 10, resulting in 653.9 million days left on the table in 20181. Expedia's® 2018 report uncovers new attitudes and behaviors driving vacation deprivation and digs deeper into the positive effects of taking time off on mental health and self-image. "Fear of Switching Off" – is it all in our heads? While this behavior has stayed mostly consistent over the past decade, perhaps there's hope for future generations – younger workers are the least likely to check in frequently, at 19 percent for 18-34-year-olds, compared to 31 percent of the 50 and over crowd. Interestingly, the pressure to be available may be self-imposed – only a small number of respondents say their managers (17%), junior staff (10%) and clients (12%) expect them to check-in daily while on vacation, proving most people need to simply give themselves permission to unplug. For more highlights from the 2018 study and the history of Vacation Deprivation around the world, check out the Expedia Viewfinder® blog. Expedia first commissioned Vacation Deprivation in 2000 to examine the work-life balance of Americans. 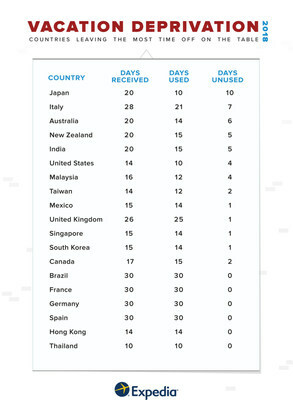 In 2005, Expedia began comparing behaviors across countries. As of 2018, Vacation Deprivation has grown to encompass 19 countries. 11,144 employed adults aged 18 and older were asked by Northstar about work-life balance in September 2018. This study was conducted on behalf of Expedia by Northstar Research Partners, a global strategic research firm. The survey was conducted online from September 19-28, 2018 across North America, Europe, South America and Asia-Pacific using an amalgamated group of best-in-class panels.